My decision to go back to a dumbphone was easy. My experience switching to a dumbphone, however, sucked salty rocks. (That’s a bad thing. I can see how this metaphor may seem like a good thing, since if you need salt, salty rocks may come in handy.) Part of the reason we were moving backwards in technology was to save money. At first, we didn’t care what service we went with but we decided to go prepaid because my parents had several phones in pretty good condition and we could take our pick. So I took all of them. Two Tracfone phones and two Net10 phones. Before I go any further, I should add that I had just finished reading the book “The Story of Stuff” by Annie Leonard and I was very eco-conscious about buying something new when we could reuse. He was right. I remember how excited I was to get an iPhone, after having a Samsung with a slide out keyboard it seemed like I was on the brink of modern technology. The phone replaced: My Camera/GPS/Nook eReader/Ipod/notebook/to do list/video camera/tv remote/Korg sound module/newspaper/calendar/olympus voice recorder/…and more. Like everyone else, for the last two years of my Verizon contract I had my head buried in my device. And during this time I was somehow blinded to the fact that it really, really, REALLY sucked at making phone calls. I hated to do it. In the winter, I couldn’t answer with gloves on. In the summer, I couldn’t talk without getting sweat all over the touch screen. I’m not a Bluetooth wearin’ kinda guy, so I’m not going to go that route. And the headphones with a mic, they just get in the way. All of that aside, the sound quality during a phone call nearly always sucked. I have said “what” more in the last two years than in the other 38 years combined. (I made that math too easy for you!) And I really was blind to all of this, perhaps willfully so. Because I didn’t want to give up this device. Thankfully, I am a slave of novelty, not technology. I think we all are. It’s just that technology is the most interesting form of novelty. When my wife suggested that we take advantage of our contract’s demise and switch back to far less expensive dumb phones, I almost felt relieved. We agreed that it wasn’t only the money, although it would save us $1200 a year. We both wanted “out” of the smart phone situation. And I was excited about getting something new, even if it wasn’t “as good as” the phone I was leaving behind. I started looking at phones, so I could get us something that was not necessarily comparable, but definitely something that was usable. 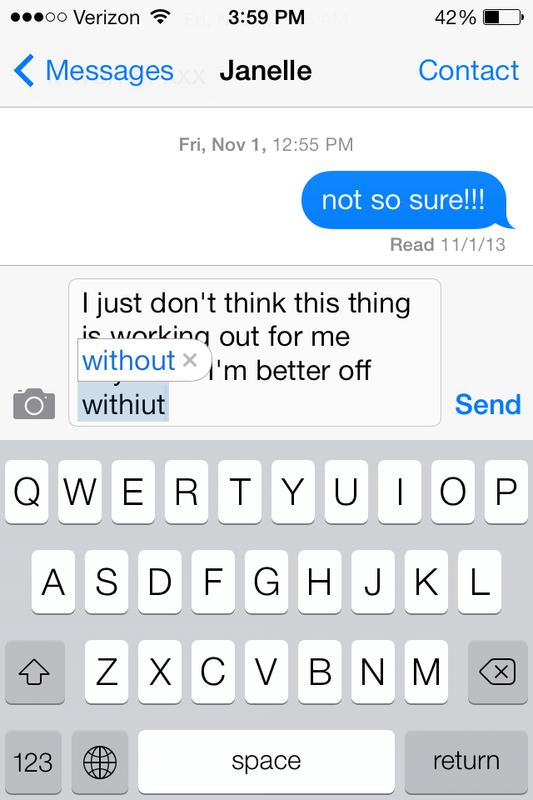 We are addicted to texting each other and asynchronous communication has it fine points. So really, the only feature we needed was a full keyboard. I chose a Samsung phone for her, and (crazily) at ZTE smartphone for me. I picked mine up first, and THANK GOD, Boost has no service at my house. So I send it back from whence it came, and we both got LG slide open phones. This isn’t a review of those phones, so I’m not going to mention the model. When you move from a smart phone to a dumb phone, there’s plenty to complain about. But in my mind I turned all of those into positive. No Apps? Not really, just the stupid common ones. Some games, but we were never really phone gamers. We prefer to be sitting at a table with a deck of cards, even though Janelle knows I cheat. The thirty dollar “dPhones” we purchased are really only good at the one thing that the iPhone sucked at – being phones. Call quality is amazing – really. 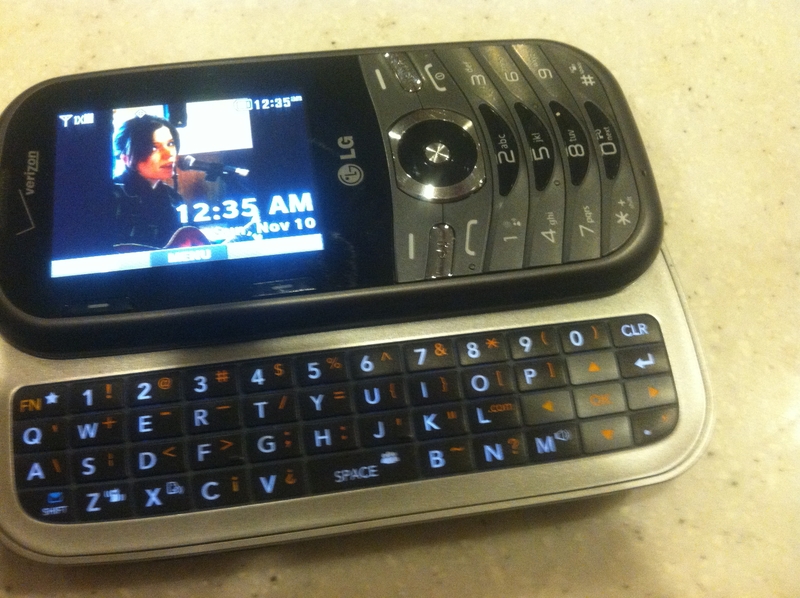 I can’t believe I could talk to anyone on the iPhone, after listening to my new $30 LG. The speakerphone is fun, and it afforded me something that my pickup truck could never do – hands free talking. My truck doesn’t have bluetooth, but I don’t need it anymore, the speaker is loud enough (and the microphone is sensitive enough) that all I have to do is make the call (voice activated calling if I want) and shove the phone in my sun visor. That’s it! I like it as a phone, and as a text messaging machine. And that’s all I really need. The iPhone? Well, it is my iPod touch now. I have music, news, and that’s about it. I’ll keep it with my when I need a slim, capable camera as well. I went back to my neglected Nook for books again, and the experience of reading this way is very pleasurable. I also started really getting into my MacBook Air again. It is so much easier to blog, to search the net, to fill out my daily journal. Almost everything I have trained myself to do on the iPhone (simply so I could justify its existence) is so much easier on my laptop. I almost viewed my computer as a necessary tool for some things, and the iPhone as the luxury item. Now I know the truth, I love the laptop, I love the nook. I used to think that I would make life simpler by consolidating everything into one device. I was wrong. I spent far too much time with my eyes and brain locked on this little device, and when I ran out of things to do, I would try to organize apps into folders in a better and more efficient layout. I was fooling myself, and spending far to much time playing with a neat little device. It is very freeing. When I walk out the door, I grab my dPhone. I look at it when I get a text, and I look at it when it rings. And that’s about all there is to look at.